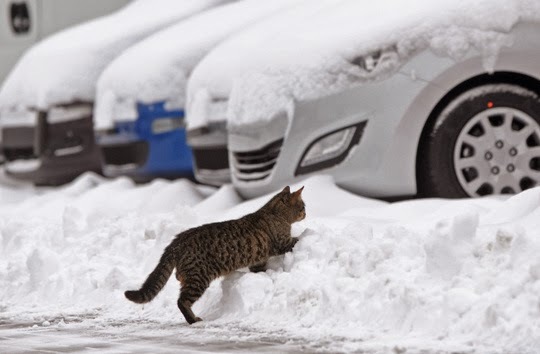 Traveling cat spotted in the snow in Warsaw, Poland. Looks cold in Warsaw. Have a tremendous Thursday. Where are your snow booties, little cat? My California cats had never seen snow, and when it came down one year, they did little kitty dances, trying to keep their paws from touching that strange white stuff. Thanks for your visit to the Write Game during the 50 States of Pray. New follower as of today! **Yikes! ** too cold for me! I live in Florida, USA!! Une vraie petite panthère des neiges. J'ai toujours eu des chats qui allaient dans la neige. A condition qu'elle ne soit pas trop profonde ... et qu'il y ai du soleil. brr! Hope you had a fabulous Christmas! Traveling cats?!? Seriously, coming across this blog via #FF today just made my YEAR! I am a HUGE cat fan - have had 2 sweeties pass away this year so it's been a tough one, but am currently the Mommy of a 5 month old tabby named Lulah. She (and both of my other precious-es) are featured on my book blog. Come stop by! New GFC and email follower! Purrrrrrrrrrrrrty! Hello, my name is Bobbybegood1 and I found your lovely blog via Debra @ She Who Speaks blog. I am a putty cat lover too and love your blog. Cheers!! Just found you via Debra as well, count me in! oh that poor baby! Hope he has a warm home!